I’ve been using Superdrug’s Colour Performance for the best part of 5 years and simply haven’t found anything better for the price. It’s a permanent dye which is gentle on my sensitive scalp. A few others that I’ve used in the past *cough Excellence Creme cough Nutrisse* have irritated and left my scalp sore despite patch tests. Colour Performance leaves me with no irritation at all. I generally either plump for the shade shown (3:0 – Natural Rich Darkest Brown) which is a very dark brown or (4:0 – Natural Dark Brown). One of the reasons I give these hair dyes so much love is because the browns are ashy in tone. Red or mahogony based browns tend to clash with the pink tones in my skin, so I’m happier with these ashier shades which are surprisingly hard to find on the high street. Dying my hair is a chore I hate the thought of, but once I’m done… I’m always left wondering why I left it so long. This dye is foolproof and has consistently returned great results for me *whispers* even over my dodgy grey roots… I’ve unfortunately been going grey since I was 19 *sniff*. And then there’s the price… I usually buy 2 of these at a time when they’re on offer. 2 for £5. I think individually, they’re around £3.20. Amazing. Colour Radiance 10. I emailed Superdrug, worried that it meant they were discontinuing my beloved Colour Performance. “Of course not”, was the reply… “they’re very popular!” Phew! 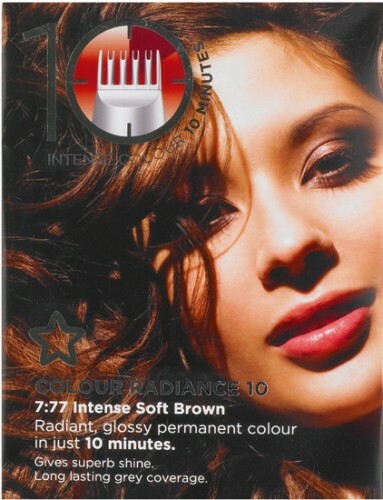 Have you ever tried Superdrug Colour Performance or Superdrug Colour Radiance 10? I’ve never tried them – I’m loyal to my Garnier Nutrisse 5.3 Macadamia, so much in fact that there are people who think I’m lucky enough to have this rich warm brown coloured hair and are blissfully unaware that like you I’m just covering up the greys! I would say I’d give it a go but after switching my dye colour on impulse I ended up looking like I was dead so for the time being, I’ll stick with what I know. I’m such a wuss! OMG same here: what a pain to have to colour your hair, but a lovely end result afterwards. My poor bathroom is not tiled but there are lots of maroon & brown splodges of hair dye on the white paint. I mostly used ‘movida’ from garnier. I prefer semi permanent. You made me want to try out their semi permanent range, and perhaps follow with a blog post Thank you. If only I’d known about this years ago! I had blonde highlights for a year over 3 years ago now, and when I went back to my natural medium brown colouring I was dying over with Nutrisse 5.3. However for some reason it brought out all the red tones in my hair and so in photos I looked really ginger, which was very unattractive with my super paleo skin. I went to various hairdressers to try and get ash tones put in, but they never seemed to work. That was 2 years ago now, and I currently have half ginger half normal hair where I had no option but to grow the ghastly stuff out. The damage it did was awful too. Her scalp is sensitive and she has reactions (but the day after) so she just soaks her hair in oil, which I don’t think is very wise because she’s going to be a permanent greaser. I’ll pick this up for her the next time I’m in Superdrug and if she doesn’t believe me, I’ll make her read this review. Every now and then I think about dying my hair a nicer shade of brown to give it some depth and shine, but I know I’m completely lazy when it comes to maintaining it. I dyed my hair brown for about a year, and I could never find an ash brown – always a red based brown, which essentially meant I perpetually went ginger. Unpleasant to say the least. It was an absolute nightmare going back to my natural hair colour (dark blonde) so I’m staying this way for the forseeable future! Great post. I will tell my friend about this colourant, she has been using Just for Men for economy reasons (you can keep it and use for more than one application) but her hairdresser gave her a telling-off last time got her hair cut. I’m sure she will appreciate the bargain tip-off. Thanks! They deserve admiration because they change the life totally…. I love Superdrug’s own brand of hair colour. I’ve tried their new “foam” one and it’s so good too. I love their cool ashy dark browns too as other brands are usually too warm. Now I only use Superdrug’s hair colours. A hairdresser once told me never to use Garneri products as they are extememly harsh on the hair. My sister tried Garnier Belle Colour and her hair went like straw ! I had warned her but it was on offer so she went ahead with it. I just recently coloured my hair using Superdrug semi-permanent creme colour and am delighted with the result. I have only been colouring my hair for a year or so and as I am passionately against animal-testing I was limited to which ones I could use. I am delighted to say that Superdrug’s products are now BUAV approved (!) which means (a) well done Superdrug, and (b) I can use their products without feeling like a hypocrite. I had previously tried Daniel Fields Watercolours, but wasn’t happy with the result and it didn’t really colour the greys at all. 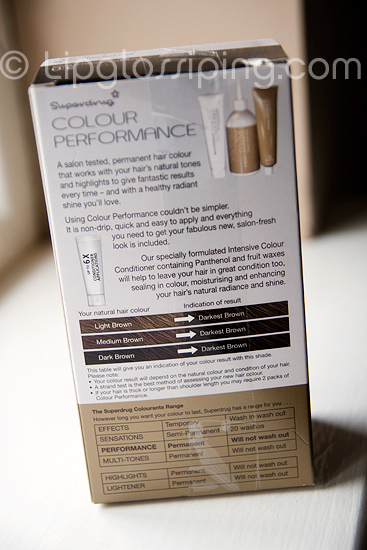 The Superdrug creme colour has totally met my expectations: easy to use, no sore scalp or itching, only 20 mins developing time, and a nice tube of intensive conditioner to use when rinsing. The result? 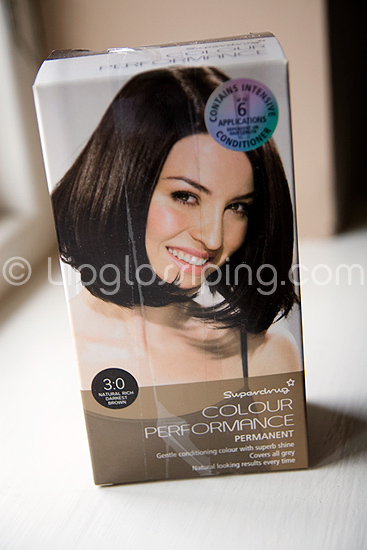 Well I have dark brown hair and used the chocolate brown colour, which has come out probably a bit darker than I3. would’ve liked, but hair is shiny, rich in colour, and I feel more confident. Plus … it’s only £3.70 or something so easy on the purse strings! Thoroughly recommended.